While post-Katrina news stories were focused on looting in the streets of New Orleans and the horrendous conditions inside the Superdome, the city’s hospitals were also at the center of chaos. At Memorial Medical Center, floodwaters rose to the point of cutting power, eliminating both air conditioning and life-sustaining devices and stranding caregivers. 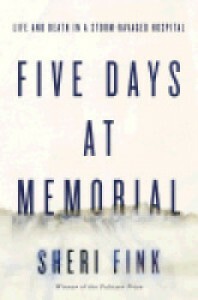 In Five Days at Memorial, Sheri Fink records attempts to evacuate the hospital and the ensuing triage decisions made by the medical staff that would come to haunt Memorial long after the waters receded. Fink’s book builds from a paced introduction of the hospital’s history and staff to the heightened tension found in a pageturning courtroom drama. Along the way, she tells the stories of patients, nurses, doctors and families – shining light into each corner of the multifaceted tale that makes up the five days spent in Memorial Medical Center. Truly deserving of her Pulitzer Prize, Fink relays each account as its own truth, without injecting bias, leaving the reader to come to a conclusion in the situation’s harrowing ethical dilemmas. Sheri Fink's six years of work is evident on every carefully researched page of her book, as is her determination to truthfully portray all of those involved. Filled with heartbreak and even moments of careful hope, Five Days at Memorial is a peek into the full spectrum of emotion felt both in and outside the hospital walls.